Pasta lovers can all agree their love affair with the heavily carbohydrate-loaded dish has led them to break their diets — and their waistbands. The noodle and sauce plate can make you feel hungry again, since it is quickly absorbed as simple sugars, which raises blood glucose — an unhealthy meal for diabetics. According to an experiment on the BBC show Trust Me, I’m a Doctor, eating pasta that has been cooked, cooled, and then reheated is significantly healthier than eating it freshly cooked because it turns into “resistant starch,” reducing blood glucose levels by half. Normal starch in bread and pasta turns into sugar quickly when it is digested. The tangled chains of glucose sugar molecules in normal starch are easily broken down into single sugar molecules and then quickly absorbed, according to HyperPhysics, hosted by the Department of Physics and Astronomy at Georgia State University. Dieters are advised to stay away from these foods because if the sugar isn’t burned off, it is turned into fat and leads to a spike in blood glucose levels. Dr. Denise Robertson, a senior nutrition scientist from the University of Surrey in England believes if you cook and cool pasta down, the body will begin to treat it more like a fiber than a starch. It does this by creating a smaller sugar rise and feeding the good gut bacteria. 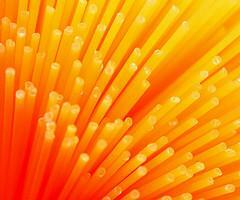 Eating cold pasta will also lead to less absorption of calories. Although this nutritional advice is valuable, Dr. Chris van Tulleken of Trust Me, I’m A Doctor and Robertson wondered how pasta lovers and diabetics could warm up to this cold dish. Under Roberson’s guidance, van Tulleken used 10 restaurant staff members at Positano, an Italian restaurant in Surrey, as subjects for an experiment. Van Tulleken sought to examine whether eating cold pre-cooked pasta or reheating pre-cooked pasta would turn resistant starch or go back to its non-resistant form. The restaurant staff had to undergo three days of testing altogether, spread out over several weeks, the BBC reported. The participants had to eat their pasta on an empty stomach as they were randomized to eating either hot, cold, or reheated pasta on different days. On day one, the participants had freshly cooked pasta with a delicious sauce of tomatoes and garlic; day two, the participants had to eat it cold after it had been chilled overnight; day three, they got to eat the pasta after it was chilled and then reheated. Blood samples were collected every 15 minutes for two hours to see what happened to their blood glucose as the pasta was slowly digested. The findings revealed eating cold pasta did lead to a smaller spike in blood glucose and insulin than eating freshly cooked pasta. However, to the researchers' surprise, cooking, cooling, and then reheating the pasta had a significant effect on blood glucose. It reduced the rise in blood sugar levels by 50 percent. “This means less insulin, less blood glucose, less hunger, and more fiber,” van Tulleken wrote in a Daily Mail post. Van Tulleken acknowledges some skeptics may view the sample size as small but places emphasis on how the results were so consistent that Robertson is confident this is “robust science.” This discovery is something that is simple and could easily improve health, especially for diabetics. Robertson plans to work with Diabetes UK to investigate whether adding resistant starch to the diet can improve some of the blood results of diabetics. This can help the 25.8 million Americans who have diabetes, according to the National Diabetes Education Program. It could also help curb the country’s obesity rate by adding resistant starch not only in diabetics’ diets, but for those overweight and obese. Perhaps taking a doggie bag at restaurants and leftovers from home-cooked meals is a healthy practice we should all start doing.